Who wouldn’t want to win to win a trip to Japan? No, I can’t afford to send you there myself, but Shonen Jump is holding a contest for their 40th anniversary to send one lucky winner! Who’s Shonen Jump? If you know Naruto, Dragon Ball, Bleach, Slam Dunk, Rurouni Kenshin, and One Piece, you should know them! They are behind some of the greatest manga artist and stories the community has ever seen. 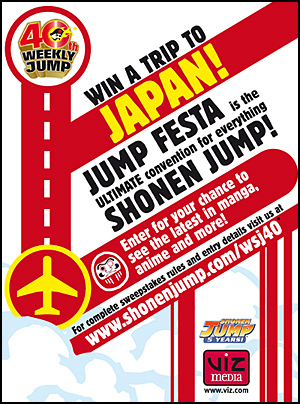 In the August issue of Shonen Jump, they are giving away a collectable poster along with the chance to an all expense paid trip to Japan to attend Jump Festa. Check out the official contest page to find out how to enter. You must be 13 years or older, contest ends October 15th, 2008.